Perhaps you've heard of The Stanley Parable? It's this game, see. It's a game about stories. It's... well, it's complicated. Maybe you're wondering what it's really about, why everyone is talking about it? Well. Allow me to elaborate. The Stanley Parable is a first-person storytelling game that functions as a sort of narrative puzzle. What's going on? Did it just end? Is it ending again? Where am I? Is this the game? Or is this outside of the game? 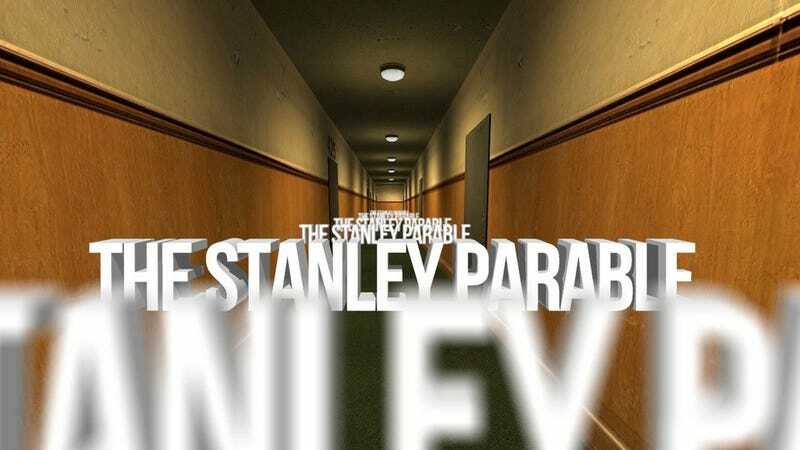 Further confusion: The Stanley Parable is a new game, but it's based on an older game—specifically, a free Half-Life 2 mod that came out right around the time I started working at Kotaku, in the late summer of 2011. It is by and large the work of one man, a young writer/designer named Davey Wreden. The mod found a great deal of success, due in large part to Wreden's surprising and winking script, as well as a show-stealing performance from Kevan Brighting as The Narrator. The new version, which is out today on Steam, is a more polished, expanded version of the original mod, though a lot of the original content remains. It's all very confusing and difficult to describe, not only because it's best experienced fresh, but simply because the sorts of storytelling puzzles The Stanley Parable is weaving aren't all that easy to lay out in sentences that go from left to right. It's a story that probably needs to be experienced to be understood—that's really the whole point—and as such, it functions both as a critique of video-game storytelling and as a proof-of-concept that the medium still has untapped potential. I'm bumping up the article below—I wrote it in August of 2011, back when Wreden had first published The Stanley Parable mod. I really recommend giving the finished version of the game a go; I've been greatly enjoying my time with it. You can also check out the free demo, like Steve did—it's not a traditional "demo" of the full game, but it's pretty fun on its own.